There may soon be a London-wide ban on gobbing in the street. 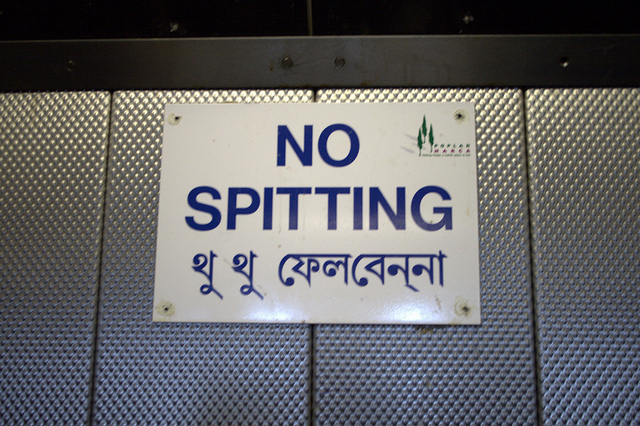 (Spitting) image by Richard Parmiter, in the Londonist Flickr pool. Two Isleworth pedestrians have been injured in suspected hit-and-run incident. Drone comes within a gnat's whisker (a 20-foot-long gnat's whisker) of a Heathrow plane. ... which could buy you a fair few houses in Grosvenor Crescent. Boris gives the go-ahead for new Wood Wharf. Public spitter? Pretty soon, you may need to back up your sputum with a 'reasonable excuse'. Has horticulturist Prince Charles been experimenting in his mum's back garden? Earplugs at the ready. AC/DC are coming to town. Are these London's quirkiest cafes? Sir Ian McKellen (Gandalf to you) pays a surprise visit to Hobbit super-fans watching in Waterloo last night.